Opera , the world leader in mobile browsers announced the beta version of upcoming Opera mini 5 . Opera currently have stable Opera mini 4.2 and Opera mobile web browser . 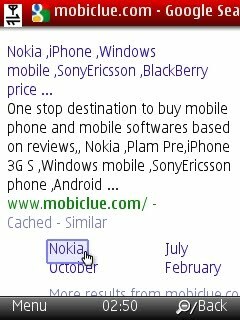 Opera mini series is free , but Opera mobile is a premium payed application . Opera mini is known for its first time efforts to bring real web experience to small mobile screens . The advantage of Opera mini is that you don’t need an advanced mobile phone to browse web pages .Even wap enabled Java phones with reasonable memory can install Opera mini . The latest version Opera mini 5.0 is now available here for download . Opera mini uses sophisticated compression mechanism that reduces the size of the data before its transferred to the client . So there by it renders web pages faster and results in lesser data charges .The latest Opera mini 5 adds another steps to the original PC like browsing in mobile phones . It now supports tabs , touch screens ,speed dial and includes a password manager . Opera mini 5 will work with all Nokia ,SonyEricsson ,LG,Samsung and other Java supported mobile devices . Opera mini faces competition from native mobile web browsers and independent products like BOLT ,UCweb ,Skyfire etc . Among which Skyfire is the real competitor that made Youtube and other web videos available on mobile videos though their latest release . Opera mini supports only limited Youtube playback from version 4.2 onwards . But ultimately it holds the first position of mobile web browsers for its simple design ,large number of supported mobile models ,fast and clean rendering etc . The latest Opera mini 5 is designed to work with Symbian S60 touch phones like Nokia 5800 , Nokia X6 , Nokia 5530 and Nokia N97 mini and Nokia 5230 ,Sony Ericsson Satio ,Samsung Omnia HD etc . The controls are specially built to support touch . Download Opera mini 5.0 . Tabbed browsing : Tabbed browsing lets the Opera mini 5.0 users to open multiple websites at same time , on tabs . Just move the cursor or finger to move on through the side-by-side view of opened pages . Engineered for speed : As said earlier Opera mini 5 concentrates more on mobile internet speed . You can set the clarity of the web pages based on speed and data plan . Pages are first transferred to Opera servers to compress them before reaching Opera mini 5.0 UI . Speed dial :Speed dial as found on Opera 10 PC web browser is now available on Opera mini 5.0 . This helps the users to move on to their favorite web pages easily . Password manager :Opera Mini asks the users to save passwords when logging in password protect web pages . So these web pages can be accessed later without typing the password again .This feature saves lot of time on mobile portals . 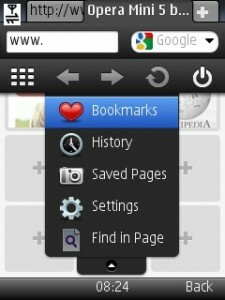 You can save web pages , bookmark ,search using Google and access history using Opera mini 5.0 settings menu . Over all the new Opera mini 5.0 awesome in design and features . A worth upgrade !! . Update: Opera released the final version of Opera mobile 10 and Opera mini 5.0. Features and direct download links are now available. I CAN’T USE OPERA MINI BCZ MY PHONE IS CHINA MOBILE. I HAVE NO SOFTWARE.OR,MY MOBILE MAYNOT SUPPORT JAVA SOFTWARES .